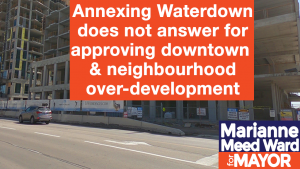 The idea of annexing Waterdown to Burlington is a diversion from the central concern of residents this election, which is overdevelopment of Burlington, due to the decisions by the current mayor and council. Before annexing another community, that hasn’t asked for this, we need to clean up our own back yard by amending the Official Plan, advocating reasonable growth not overdevelopment, and respecting residents enough to include them in decision-making before the fact. Burlington residents have not been consulted on annexing Waterdown, nor have they asked for this. The people of Waterdown and Hamilton have not been consulted. Burlington city council, Halton Regional council and Hamilton city council have not been consulted. So much for collaboration. Enough of “Hail Mary” ideas cobbled together in a political back room and launched on an unsuspecting public for political gain, upending the democratic process in the middle of an election. Residents deserve better from their elected officials. Regarding amending the Places to Grow Act, the province has already given Burlington city council the tools to control growth – but this council isn’t using the tools we already have. Overdevelopment in Burlington is the direct result of decisions by the current mayor and council to go beyond provincial growth requirements and approve developments at 2, 3 or 4 times Official Plan provisions. Burlington’s share of growth from the province is 185,000 by 2031; as of the 2016 Census we were at 183,00. We have met or surpassed our growth – 13 years early. And yet, the current mayor and majority of council approved a new Official Plan that takes Burlington well beyond provincial targets, including adding up to 30 more downtown high-rises. I’m the only councillor who voted against this new plan. I’m the only candidate who is committed to amending the Official Plan, which this mayor supported. I’m the only candidate committed to working with the province to remove the Urban Growth Centre and Mobility Hub designations from downtown which would have relieved growth pressure. The current mayor did not support those motions, leaving the downtown at risk. I’m the only candidate committed to taking only as much growth as Burlington infrastructure will allow, when new growth targets are assigned by Halton Region to 2041. We need a strong voice and advocate in the mayor’s office to take action using the tools we already have for reasonable growth, not overdevelopment. That’s why I’m running for mayor of Burlington: to listen to residents before announcing decisions, and take action on their concerns – overdevelopment, not annexing neighbouring communities. The public won’t be fooled by 11th hour declarations and promises, when the current mayor had 12 years to act – 4 as a councillor and 8 as mayor. The time for talk is over. It’s time for action on the issues that matter to Burlington residents. Marianne Meed Ward has served as City & Regional Councillor for Ward 2, which includes downtown Burlington, since 2010.